Robert “Bob” Evans at the AV Wall. 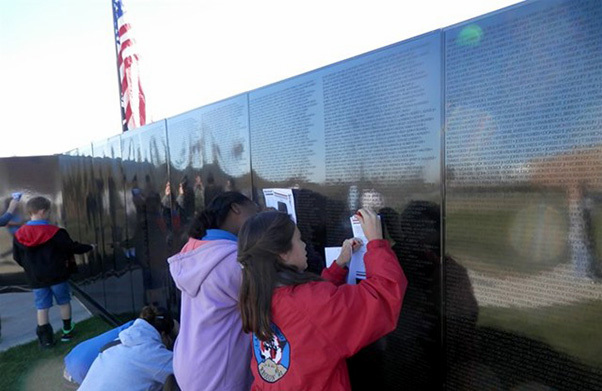 PALMDALE, Calif.–This year’s presentation of the Antelope Valley Vietnam Memorial slated for Nov. 8-13 is themed to honor and celebrate the 35th anniversary of the original Vietnam War Memorial on the Mall in Washington, D.C. The original keynote speaker for the Veteran’s Day ceremonies to be held at Marie Kerr Memorial Park was intended to be Robert “Bob” Evans, a retired Army captain who was a platoon leader with the 101st Airborne Division in Vietnam. Bob was a popular choice because he was known, and loved, by many, mostly in the Vietnam War veterans’ community in the Antelope Valley. He survived a wound that shattered his jaw when he was hit with an AK-47 round while leading his troops, from the front. His friend, and fellow Vietnam combat veteran, Gerry Rice, recounted that then-Lt. Evans was signaling for his men to get down when he was hit. Nine years of reconstructive surgery followed, and the mark of war was covered cosmetically with a wispy beard. A small, slight man, he was incessantly cheerful and friendly, and he died on April 7, 2017. His heart gave out, which followed years of heavy smoking and alcohol intake, and too many memories many veterans would like to forget. Because of this, visitors to the memorial known locally simply as the “AV Wall” will not hear from Bob Evans, who doubtless would have found the right words. His intelligence was keen, his wit ready, his emotions in check, but rueful. He did not speak much about Vietnam to me, but he did share memories of his return home. He was on a stretcher in a bus headed to the military hospital in Oakland, Calif., where he would spend months in his recovery. For many Vietnam veterans, the attempt to find “normal” was an effort to respond to their profoundly abnormal combat experiences. Bob Evans did not wait to be drafted. He abandoned acceptance to prestigious universities and earned his commission through Officer Candidate School. He willingly entered the most dangerous job in the world, combat infantry. Still boyish in appearance at 69, he died — like many Vietnam War veterans — entirely too young. 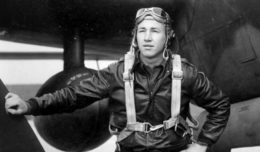 “This year’s event is really to honor the spirit of Bob Evans,” said Linda Willis, Secretary of the AV Wall Committee, and friend of Captain Evans. His death accounts for why I am speaking at the AV Wall memorial on Nov. 11, a Saturday, at 11 a.m. Both of us were at the dedication of the Vietnam Memorial in Washington, although we did not know each other. We were surrounded by tens of thousands of our comrades. The Vietnam Memorial in Washington was dedicated on Nov. 13, 1982. I was reporting for United Press International. A search of the UPI archive revealed a number of stories. 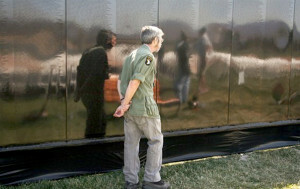 One was about erecting the first, black marble panel and a delegation of Gold Star mothers honored before the unveiling. These were mothers who lost their sons in Vietnam. The rear-view mirror of 35 years is to see through a glass darkly. It is half-of-a lifetime ago, before my 30th birthday. The crowd estimate in Washington for the 1982 “Welcome Home” parade numbered more than 150,000. One veteran in the parade was Jim Lodsdon, an infantry sergeant in a wheelchair who had lost both legs to a mine a dozen years earlier when he was barely out of his teens. Jim Lodsdon accepted bear hugs and handshakes from dozens of former war buddies and strangers who stopped to chat and say ‘Welcome home,’ — albeit a decade late. Members of the public visit the AV Wall. Like thousands of other Vietnam veterans who gathered in the city over the weekend, Lodsdon was bearded, wore a jungle hat and had a chest full of combat badges. Lodsdon, 33, of Lafayette, Ind., was in a wheelchair — having lost his legs 12 years ago when he stepped on a mine in the jungles of Southeast Asia. The former Army sergeant joined the five-day National Salute to Vietnam Veterans, highlighted Saturday with a parade down Constitution Avenue and the dedication of the new Vietnam Veterans Memorial. The affair — which drew an estimated 150,000 people — served as a belated welcome home for the veterans of the nation’s longest war. “Yeah, I spent a lot of time in the hospital with guys from the 1st Cav,” said Lodsdon. When he lost his legs, Lodsdon was 21 years old. Lodsdon spent nine months in a hospital and went on to earn an engineering degree. He was recently laid off from a factory job. I read those sentences today, and that quotation, and it is all weirdly contemporary. Layoffs in Indiana. The joys of camaraderie, and buddies who created friendships waiting for their wounds to heal. Here are a few sentences from another story I reported about the first panel of the Vietnam Memorial. 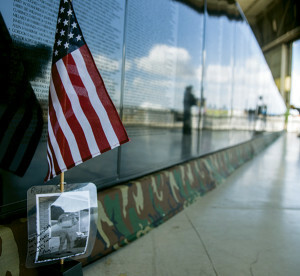 A black granite stone bearing the first 665 names to be inscribed on a V-shaped monument that will eventually list all of the more than 58,000 U.S. Vietnam war dead was revealed under clear, blue skies a few hundred yards from the Lincoln Memorial. “Up until now there have been only two names on the mall — George Washington and Abraham Lincoln. But on this historic occasion 665 names have been added,” said Jan Scruggs, the Vietnam veteran who started the project in April 1979. Like the war it commemorates, the monument has been controversial. At Wednesday’s unveiling there was no controversy, just an eight-member American Legion color guard from Cheverly, Md., and tears from several mothers who lost sons a dozen or more years ago. One mother blinked back tears as she and her family accepted a rose at the base of the monument. Emogene Kupp of Alexandria, Va., was dressed in a white suit; the past president of the Gold Star Mothers quietly mourned her son before she unveiled the black stone. “I don’t know if they called it the Tet offensive. It was June 1968, south of DaNang. He was in the 196th Infantry that took such heavy casualties. “I buried him on his 21st birthday. He was my only son,” Mrs. Kupp said quietly before walking to the podium. At last year’s ceremonies at Palmdale’s beautiful amphitheater at Marie Kerr Park, the AV Wall Committee and Point Man of the Antelope Valley honored Gold Star parents of the Vietnam War, and the moments were just as poignant, just as searing. Death of a grown son or daughter in war delivers a trauma blow that does not heal with time. The event only recedes. In the years since the 9/11 attacks that shaped our 21st century world, my son went to war in Iraq and Afghanistan. I returned from reporting in Iraq and Kuwait with National Guard troops from the AV to attend the memorial for Allan Kendall Walker, Marine, and our Antelope Valley’s first killed-in-action of the Iraq War. He was 28, and the oldest Marine in the unit he led. That was in 2004, but also seems immediate and recent. On Veterans Day, ceremonies are convened to honor all who have served, wherever and whenever they served. But among those who have served, or loved them, the missing and dead are always remembered and honored with solemnity. It is all that we can do. The Antelope Valley’s Mobile Vietnam Memorial Wall is a half-scale replica of the Vietnam Memorial in Washington. Our local monument is portable, and has traveled vast distances of our Southern California region. At 252 feet it is slightly more than half the length of the black, marble wall on the Washington Mall. With 58,318 names of the American servicemen and women killed during the Vietnam War, the AV Wall is the nation’s most accurate tribute wall to the national memorial. 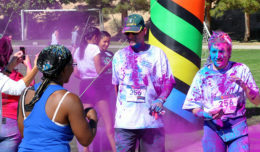 This year’s presentation of the AV Wall runs from 5 p.m., Nov. 8 until 8 a.m., Nov. 13 at Marie Kerr Park’s Palmdale Amphitheater, 2723 Rancho Vista Boulevard. Major ceremonies fall on Veterans Day, Nov. 11, at 11 a.m., and there will be a Candlelight Memorial Walk that night at 9 p.m. Taps is played nightly at 10 p.m. and the AV Wall is open to the public 24 hours daily during the display period. “Veterans will come at 1 or 2 a.m. just so that someone won’t be running up to try and talk to them when they search for a name,” said Stacia Nemeth, a member of the AV Wall committee. 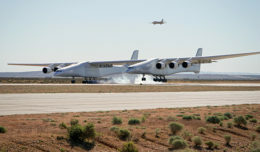 More information can be obtained at www.AVWALL.org or by calling 661-524-6408. Editor’s Note: Dennis Anderson, Sgt. U.S. Army, 1972-75, a veteran journalist, will be keynote speaker at the AV Wall on Veterans Day. He served in Cold War Europe at the end of the Vietnam War Era. He traveled to Iraq as an embedded reporter, and reported on the dedication of the Vietnam Memorial in Washington on Nov. 13, 1982.